At 10:37 am PDT on Saturday, 22 March 2014, the quiet along the North Fork Stillaguamish River near Oso, Washington, was broken when a hillslope collapsed, crossed the river, and swept out onto the valley floor. Thirty homes were buried by the landslide. As of 12 April, 36 bodies had been recovered and seven people remained missing. One survivor, Amanda Skorjanc, reported a terrifying sound like a runaway truck and saw houses exploding just before her neighbor’s chimney came barreling through her front door. Amanda and her 5-month old son, Duke Suddarth, were carried more than 700 feet before coming to rest in some nearby trees. It took six rescuers to free them from the mud and detritus of their splintered home. The landslide did more than devastate the small community of Oso, it reignited a decades-long discussion between state and federal geoscientists, emergency managers, and state and local government officials about the need for a national landslide inventory and assessment program. The economic and social impact of landslides throughout the U.S. is poorly understood, but each year there are an estimated 25 to 50 fatalities and the aggregated cost tops two billion dollars (NationalAtlas.gov; Geologic Hazards-landslides). The Arizona landscape is no stranger to landslides. The entire spectrum of landslide types – debris avalanche, debris flow, earthflow, creep, rock fall, rock slide, topple, rotational and translational landslides - are encountered here. 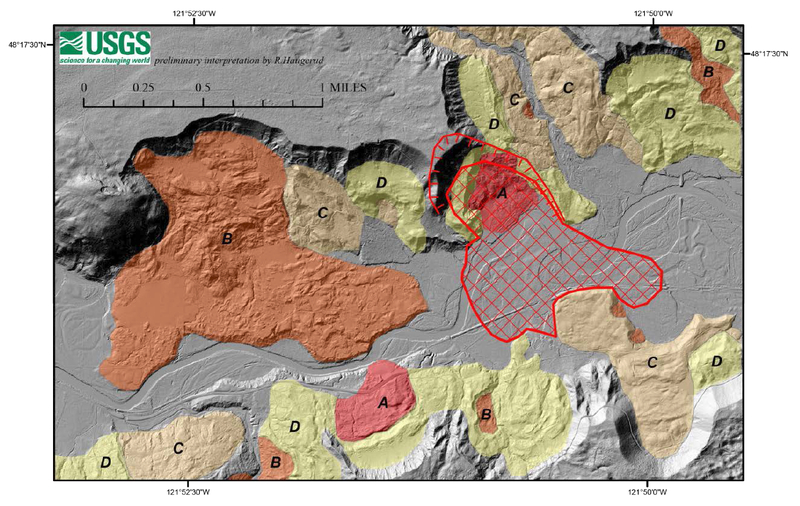 Figure 1 from the Arizona Division of Emergency Management’s (ADEM) “2013 State of Arizona Hazard Mitigation Plan – Risk Assessment” provides a thumbnail sketch of the State’s landslide incidence and susceptibility. The incidents portrayed here include only two recent events and otherwise represent a narrow time window from 1980 to 1985. The narrow scope of these data accentuates how limited resources have hampered identifying and documenting landslides, the first key step in risk assessment and mitigation. US Route 89 Landslide, February 2013. 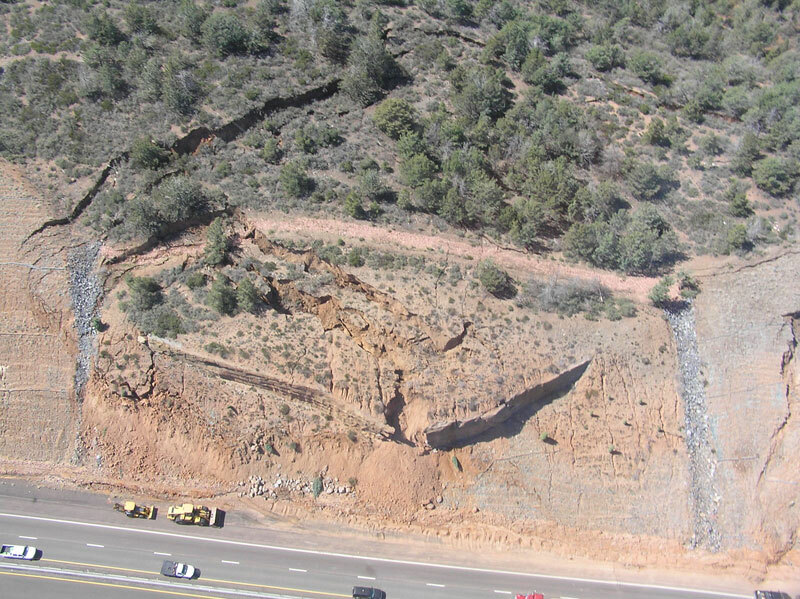 On 20 February 2013, a landslide along the Echo Cliffs south of Page, Arizona, sliced through several hundred feet of US Route 89, causing the Arizona Dept. of Transportation (ADOT) to close the 23-mile section of road between Bitter Springs and Page (fig. 2). 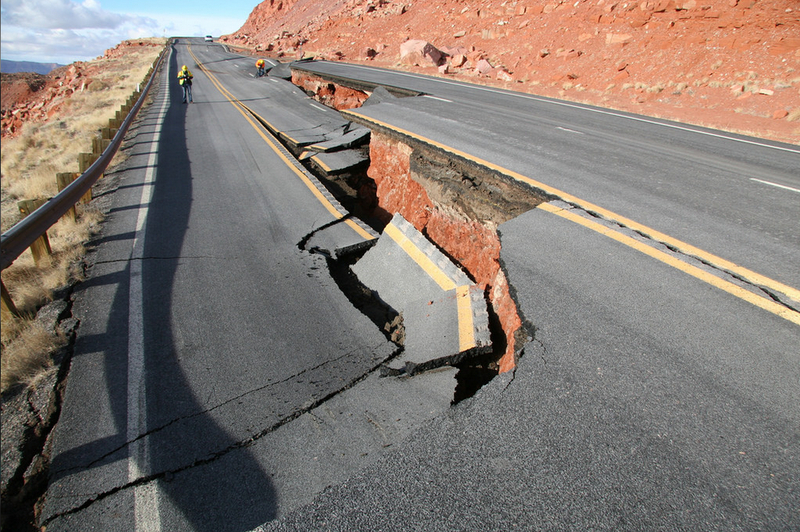 While no one was injured, it was months before a suitable detour, US Route 89T, was open for restricted traffic. The price tag for assessing and engineering a solution to put US Route 89 back in service is expected to approach $37 million; some of which was used for paving Navajo Route 20 to prepare it for detoured traffic. Repair of State Route 89 is scheduled for the latter half of 2014. It involves cutting the roadway approximately 60 feet into the cliffs and using that rock to construct a downslope buttress to stabilize the area. 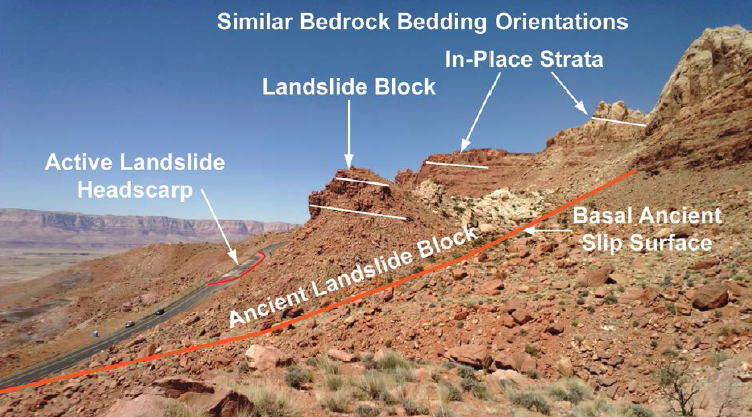 The slidemass at US Route 89 is part of a larger, ancient landslide block adjacent to the Echo Cliffs. This larger landslide is referred to as a Toreva block slide, characterized by competent rock resting on less competent material that fails, slides downslope and rotates such that the strata dips back into the hillslope (fig. 3). Parry Reiche (1937) first described this landslide type from an exposure near the village of Toreva on the Hopi Indian Reservation of northeastern Arizona. State Route 87 Landslide, March 2008. On 21 March 2008, a rotational slump landslide occurred near mile marker 224 on State Route 87 (SR‐87) (fig. 4), in Gila County. The highway was closed for six days while initial cleanup and mitigation efforts were underway. Between 2005 and 2008, several other smaller slope failures, collectively referred to as the Iron Dike landslides after nearby Iron Dike Mountain, occurred in the area. These recent slide masses are part of a paleo-landslide complex involving at least four discrete landslides that date to the Late Quaternary-Holocene. The paleo-landslide mass that hosted the 21 March event comprises a headwall that is approximately 1500 feet wide and a runout mass that extends nearly one mile (Diaz and others, 2008). A reconnaissance report by the AZGS (Diaz and others, 2008) showed that the 21 March slide, which entrained wet, sandy sediments with clay-rich layers, occurred within days of moderately heavy rainfall that delivered 0.24 inches of rain in just 77 minutes. The heavy rain likely precipitated an increase in internal pore pressure that destabilized the slope triggering the failure. The final cost of mitigating the slide area and repairing State Route 87 was expected to run more than $18 million (Bechman, 2008). Debris Flows of Southeastern Arizona. Torrential rain storms frequently accompany Arizona’s summer monsoon season. Extreme versions of these storms are capable of generating debris flows - dense slurries comprising 60 to 90% solids by volume (a chaotic admixture of rock, gravel, sand and clays) and 10 to 40% water - in the mountainous terrain of Arizona’s Basin and Range Province. In July 2006, five days of rain in southeastern Arizona culminated on 31 July with as much as eight inches of precipitation in less than six hours in some mountain ranges. Record precipitation fueled historic flood peaks on some streams and washes and triggered 100s of debris flows. 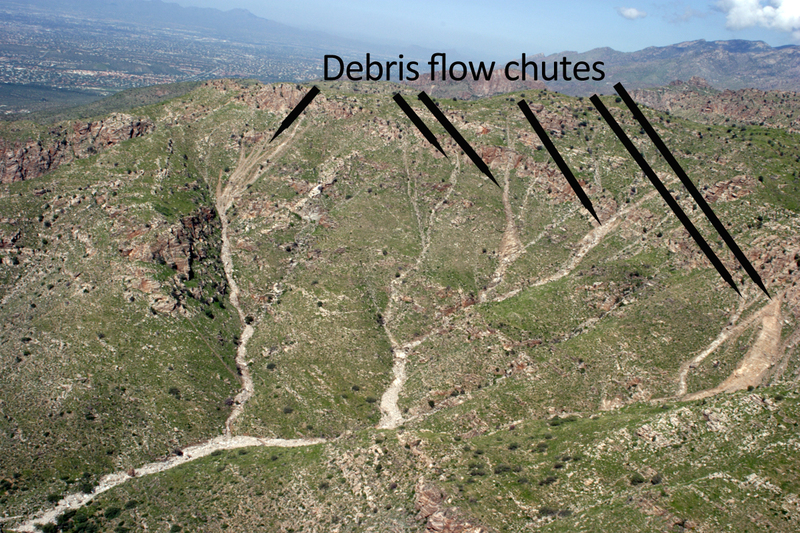 The Santa Catalina Mountains north of Tucson saw ~ 435 discrete debris flows form on steep mountain slopes (fig. 5). Most were small-volume events involving failure of thin hillslope or gully deposits. Some debris flows merged to create larger volume flows that continued several miles down canyon. These dense slurries can move at 10s of miles per hour, making them a serious threat to life and property. Because the debris flows of 31 July were mostly confined to mountain canyons, they caused limited damage to roads or structures and there were no fatalities. In Sabino Canyon Recreation Area, however, debris flows ripped up the tram road and destroyed several outbuildings. In 2007, the U.S. Forest Service received $1.2 million in federal funds from the Emergency Relief for Federally Owned Roads (ERFO) Program to re-open the main road and restore the tram service to Stop 9; the final price tag for all debris flow-related repairs was $1.5 million. Now In the grip of a 12-year long drought, Arizona’s voracious, spring-summer wildfires devour the trees and grasses that intercept rainfall and runoff and anchor unconsolidated rock and sediment on the steep mountain flanks. When monsoon rains predictably follow severe wildfires, numerous debris flows may occur with disruptive and potentially deadly results. Rockfall in Oak Creek Canyon. During the afternoon of June 4th, 2009, Enocha Ryan was conducting a healing session with a client at her sanctuary retreat at the base of Indian Point in Oak Creek Canyon, north of Sedona, Arizona. Suddenly she heard what sounded like explosions coming from high up on the cliffs above her home. Enocha went outside to identify the source and narrowly escaped being struck by a large boulder. That boulder plowed through her pump house and continued towards her home, smashing a hot tub before coming to rest in her rose garden, without disturbing a single rose, no less (fig. 6). The five-foot diameter basalt boulder is there today (Gootee, 2009). Enocha’s experience illustrates the damage that rock falls, slides and topples, can cause in the canyons and bluff country of Arizona’s Mogollon Escarpment and Transition Zone. While the economic impact is a fraction of that observed where large rotational slides disrupt roads and highways, property owners incur a high cost and injuries or deaths are not unheard of. 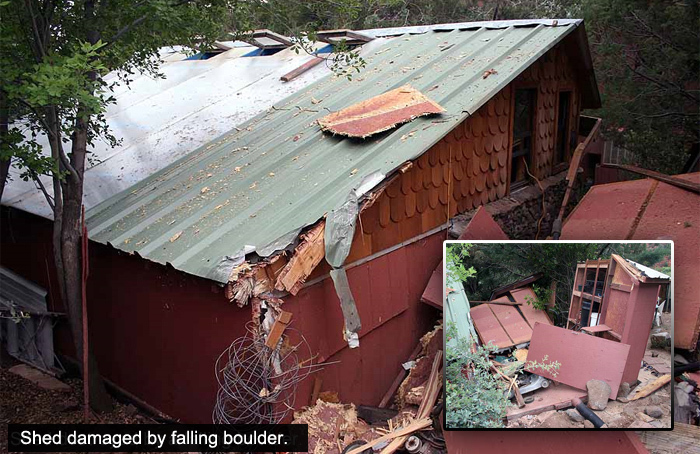 In December 2013, a rock slide in Rockville, Utah, destroyed a house killing two people. In 2003, the U.S. Geological Survey broached the subject of a national landslide hazard mitigation strategy in USGS Circular 1244. Their 10-year goal: “substantially reduce the risk of loss of life, injuries, economic costs, and destruction of natural and cultural resources” from landslides and other ground-failure hazards (Spiker and Gori, 2003). Unfortunately, federal funds for the program never surfaced. Nonetheless, there is a consensus among federal and state geoscientists that the tenets of that 2003 report remain valid. As laid out in Circular 1244, the national landslides hazards mitigation strategy comprises nine major elements (Table 1) that employ a wide range of scientific, planning and policy tools to reduce losses from landslides and other related ground-failure hazards. The availability of high-resolution LiDAR data would greatly enhance identifying and mapping Holocene-age landslides (fig. 7). The price tag for LiDAR data is steep, ~ $100 to $200 per square mile for regional-scale projects, ballooning to ~$900 for small-scale, piecemeal projects. The cost- benefit ratio (Hallum and Parent, 2009), however, is conservatively estimated at 1:3.5, so for every dollar spent, the socioeconomic benefit is $3.50. The geologic and geological engineering communities are embracing and lobbying for increased LiDAR coverage in landslide prone areas. Table 1. Elements of the national landslides hazards mitigation strategy outlined in USGS Circular 1244. A functional landslide hazards identification and mitigation program requires the collaboration of stakeholders in academia, state and federal government, and the private sector. It will also require increased investment in landslide hazard research, mapping and monitoring, and mitigation activities coordinated at the national, state and local levels (Spiker and Gori, 2003). Consensus on the type and nature of data required to move forward exists. It is now a question of marshalling and coordinating the necessary resources to establish a comprehensive landslide hazards mitigation program that will reduce risk, preserve property and save lives. Diaz, M., Gootee, B.F., and Youberg, A., 2008, Reconnaissance report on the Easter Weekend Landslide of 21 March 2008, SR-87, Gila County, Arizona. Arizona Geological Survey Open File Report, OFR-08-04, 1 photo, 10 p.
Gootee, B.F., 2009, Watch for falling rock: A Sedona rock fall. Arizona Geology, Environmental Geology column. Reiche, P., 1937, The Toreva Block, a distinctive landslide type. Journal of Geology, v. 45, #5, p. 538-548. 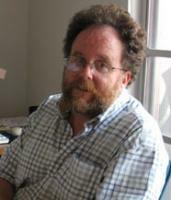 Spiker, E.C. and Gori, P.L., 2003, National landslide hazards mitigation strategy – A framework for loss reduction. U.S. Geological Survey Circular 1244, 63 p.